Yes, mea culpa, I really did tweet some pictures of my cat wearing a hoodie* earlier. But please, rest assured, no lasting damage was done to the cat (well ok, apart from to her dignity) in the two minutes I managed to get her to keep the bloody thing on. 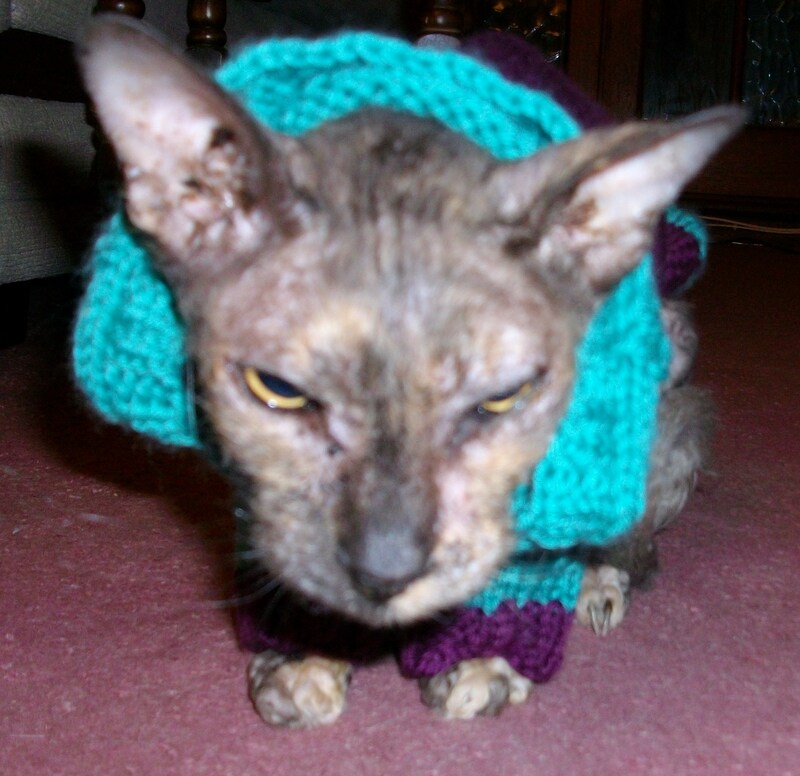 And for those wanting an explanation of why on earth I would even think of dressing my cat up: here’s why. Unfortunately, this is a scene that has already been repeated this winter, and she’s by no means out of the the woods yet. 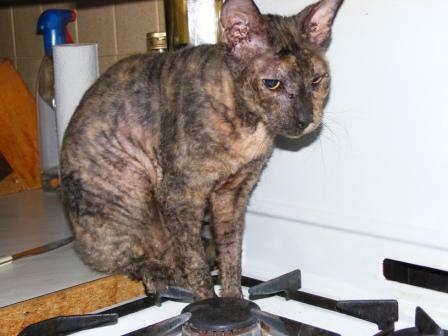 Tipsy is a 14 year old Cornish Rex. She’s old, she’s nearly bald, and she really really feels the cold. Most of the time she sleeps curled up to a hot water bottle and a microwavable heat pad, with our Siamese cat curled up with her for added warmth and comfort. The problem is though, that on some days that’s all she wants to do, because getting up and moving around means moving away from her various heat sources. A very talented friend of a friend offered to have a go at knitting one. She found the hoodie pattern on the Internet, set to work, and it arrived in today’s post. Suffice to say, Tipsy hated it. Ah well, it was worth a try. But it looks like it’s back to the drawing board again. *Just to be clear. I do not support dressing up pets for fun, fashion, or whatever other ridiculous excuses people use. 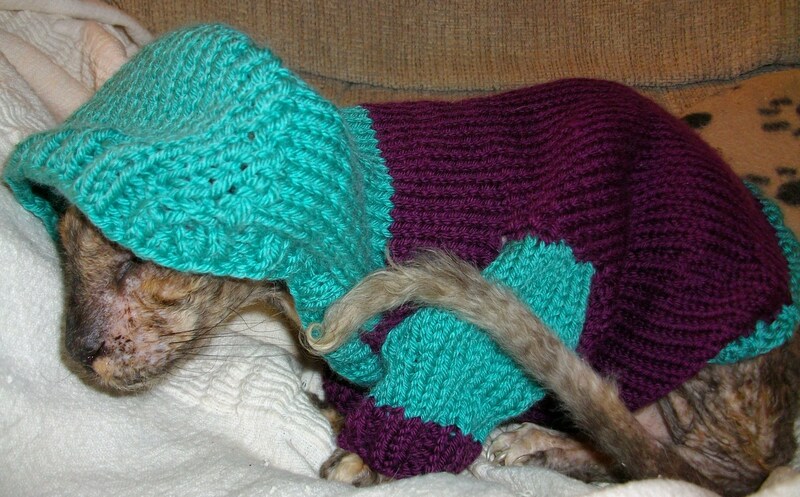 Elderly pets who need to be kept warm are an entirely matter however. I went into Accessorize once, and they had these little jumpers, and I thought they were for babies, then I looked closer and realised they were for dogs…. Cats aren’t dogs though. Easier to put one over on a dog. Poor kitty! I hope she gets well and stays warm. Rather than a knitted jumper, why not make something out of soft fleece? The hood is a big no-no, so don’t go there. It could be the texture or holes of the knitting that was the real objection. Or the weight. Soft fleece overcomes all of these problems. If you have the central heating radiators, you can get a mock lambswool sling that clips over them. My 19yo loves hers. Hope she gets over the infection soon. Poor kitty. Yeah cats love those radiator cradles I was thinking the same thing. Maybe one without sleeves or a hood, like the ones in the video? In my experience of trying to perch hats & other light things on cats heads for brief selfish personal amusement, cats don’t like wearing hats. And if the hood’s not being used it’d probably be an irritation to have it flapping around behind her. I think sleeves must be a weird feeling for a cat, whereas something that’s just around the body might be less distracting. My central heating pipes run under the upstairs floorboards on the landing and in the bathroom, and my cats have spent all winter spread out on those warm spots. Sometimes I wonder how cats managed before humans developed soft furnishings and central heating. Yeah, I don’t think cats are fond of sleeves either. Perhaps a saddle-shape which incorporates a bib arrangement at the front so it does not slip around? 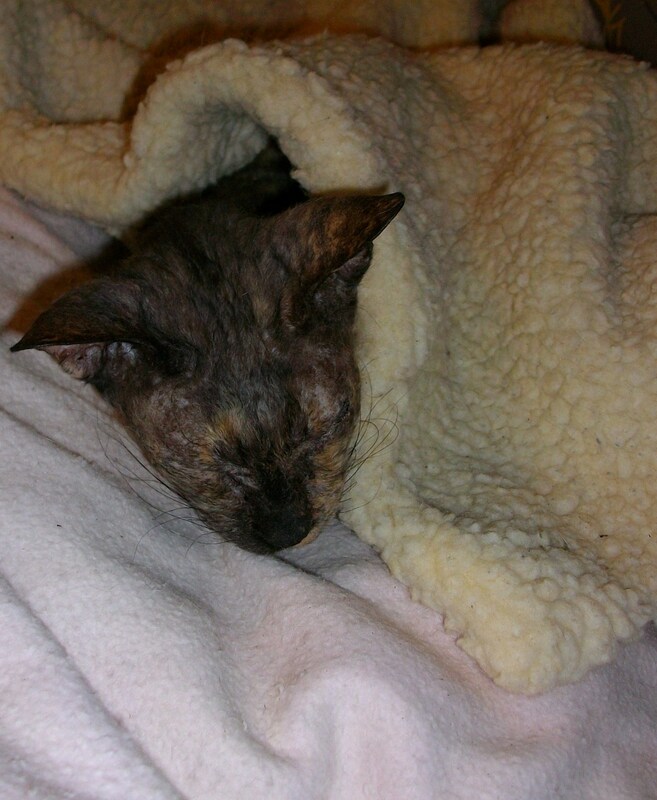 If a soft, flexible material like fleece was used, then kitty might get used to it when she discovers the warmth factor. One or two metres of fleece should be enough for several style trials. I saw some soft velor-type throws in Primark the other day (£4). Not sure what the fabric was, I am not an expert in these matters. Hi everyone, and thanks for all the suggestions. 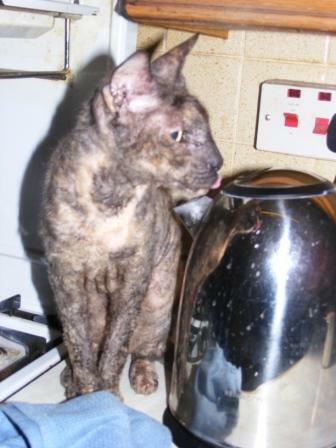 Unfortunately as you may have seen from my twitter stream, Tipsy was put to sleep this morning after taking a sudden turn for the worse, so jumpers and things are all a bit redundant now. Poor little dear. At least she is not suffering any more. Aaarggh sorry Cath, not a nice thing at all. I think this is my first time at your site – found the pictures of Tipsy to be really endearing. She definitely displays an attitude. I am sorry to hear she’s gone. I do wonder about the suggestions given by MariaS and FAB Libber. A friend’s cat is going through similar problems right now.